A FEW familiar faces could soon be joining David Moyes at Real Sociedad, as the the Scot eyes a number of Premier League transfer targets. Moyes admitted that he had been speaking with a number of ‘UK football people’ over the Christmas period as he looks to bolster his squad. Linked with the likes of Adnan Januzaj, Emre Can, Mohamed Salah and Arouna Kone, Moyes looks set to bring in some big name loan signings. And with just one win in his first five league games, the former Manchester United and Everton boss is looking to strengthen. 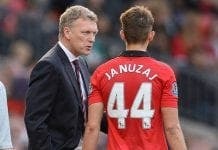 “If possible I would like to add to the squad, but it would be more likely to be players on loan rather than permanent transfers,” Moyes said.